Steven (Chicagoland, United States) on 29 September 2011 in Landscape & Rural and Portfolio. The Arch Rock seen in Valley of Fire State Park in Overton, Nevada. A gorgeous capture Steven, seem like these scenes are all over AM3 at the moment, did half of America's photographers all ride out to the desert in unison? Beautiful shot.. love the hint of blue on top of the frame.. superb contrast. Nature's sculpture - beautiful colours and textures. Beautiful picture with nice colours! Stunning colors, they match so well. fantastic colors in this great rock formations. I cannot help but start seeing faces in these shapes . . imagination is a wonderful thing ! ... it is fantastic. I love this area. You can go there everyday and still find something interesting. Good eye (left I guess). 4**** from me. Excellent ! This is some very rich texture. Another absolutely beautiful image! I would love to go visit there someday. This is gorgeous! 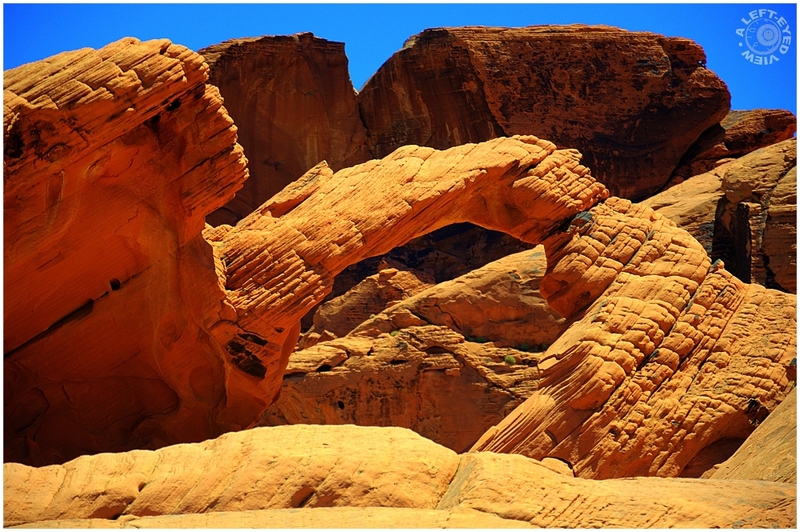 stunning layers of sandstone in this fantastic natural structure, and again these incredible and fascinating colors! Very interesting stone structure! Great capture with splendid tones and texture. Incredible structure, and the light is just wonderful Steven. I just love the layers and textures here. This must truly be a wondrous place to visit. I love the way that rock is carved. It is amazing what the elements can do. The framing on this is perfect.